3D printers are emerging as a key growing printing technology in the global landscape. In India, the market for 3D printers is at its nascent stage. However, it offers huge growth opportunities in the coming years. 3D printing helps the industry think faster, innovate better and broaden up the horizons of manufacturing. It is an example of technology and manufacturing working together to become more flexible and scalable, ensuring enhanced efficiency and quality. There has been a gradual shift from conventional manufacturing techniques to new and emerging technologies that provide higher precision and resolution, thus speeding up the manufacturing process. 3D printer software enable users to create digital models from which physical objects are made. Primary benefit of this technology is its ability to manufacture customised parts as needed without costly machinery or dies for casting. 3D printing is a rapidly growing industry. It has enhanced its value in diverse sectors such as automotive, healthcare, aerospace and defence (A&D), consumer products, industrial products, education and research. 3D printing technology helps industries streamline design processes and lower production costs. Today, manufacturers across a broad spectrum of industries, including automotive, aerospace, dental, discrete, high-tech and medical products are all actively piloting and using 3D printing technologies. Prototyping continues to be the dominant reason why enterprises adopt 3D printing, providing the opportunity to speed up new product development and time-to-market. Moreover, 3D printing methods also ensure substantial savings on tooling in comparison with traditional manufacturing technologies, such as injection moulding, computer numerical control (CNC) method and vacuum casting. 3D printing is emerging as the fastest growing technology worldwide. According to a market research report published by MarketsandMarkets, 3D printing market is expected to reach US$ 32.78 billion by 2023. The latest market study released by Technavio predicts that the global 3D printer market is projected to reach US$ 11.92 billion by 2021, at a CAGR of more than 35 per cent from 2017 to 2021 (Fig. 1). 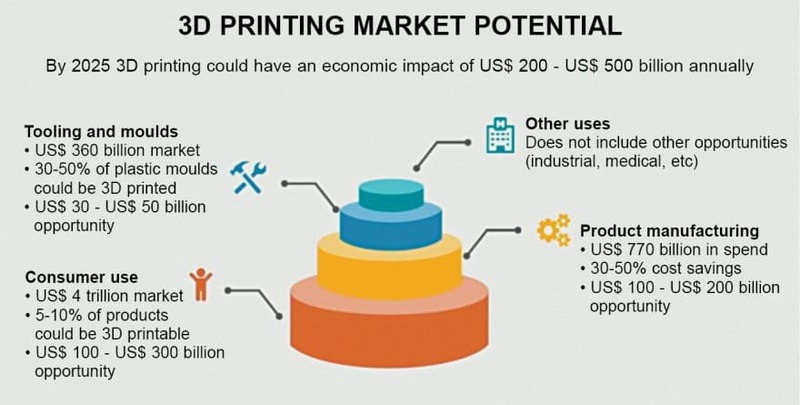 McKinsey Global Institute indicates that by 2025, 3D printing could have an economic impact of US$ 200 to US$ 500 billion annually. This huge market opportunity is attributed to factors like ease of development of customised products, ability to reduce overall manufacturing costs and government investments in 3D printing projects for the development and deployment of the technology. North America holds the largest share of the 3D printing market, followed by Europe and Asia Pacific. Global market growth is driven by strong demand from A&D, healthcare, education and consumer product industries. In India, the market for 3D printers is still at a nascent stage. However, it offers huge growth opportunities in the coming years. According to 6Wresearch, a market intelligence and advisory company, the 3D printer market in India is projected to touch US$ 79 million by 2021. 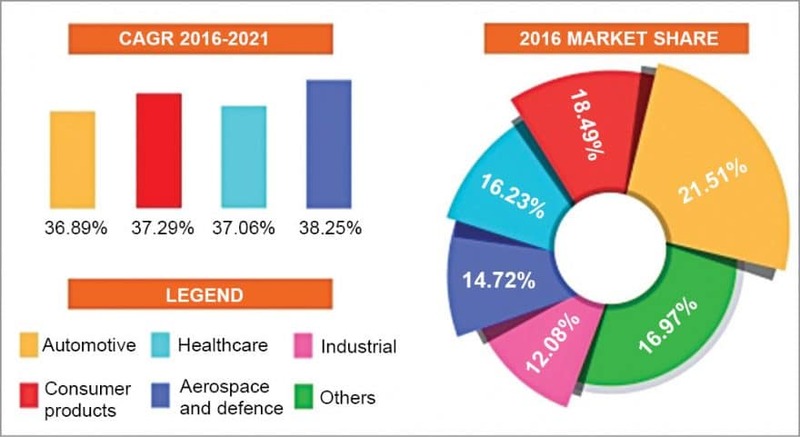 The thrust on domestic production, demand for lean manufacturing and increasing penetration across various applications, coupled with Make in India campaign will spur the 3D printer market in India. With initiatives like Make in India, the domestic manufacturing sector is being encouraged. This will automatically play a pivotal role in the growth of the local 3D printing industry. 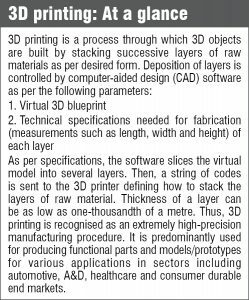 Considering benefits associated with 3D printing, various industries in India have already started using or are ready to use 3D printing technology. Therefore the 3D printing service industry is growing at a good pace, but the 3D printer manufacturing sector will need a strong boost. At present, India primarily imports 3D printers from countries such as China, the US and Germany. However, with government initiatives to boost domestic manufacturing, many local players are expected to emerge. Compared to global 3D printer manufacturers, Indian players are yet to establish their brands and lack volumes. 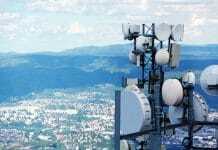 However, in the last few years, a significant number of companies in India have come forward to explore this segment. About two to three years ago, there were almost no companies in this industry—this has increased to five to seven companies. People are getting easy access to 3D printing, and the market’s expectations are high. The rapidly growing user base of professional computer-aided design/computer-aided manufacturing (CAD/CAM) help make engineering designs in the form of digital models that can be directly used as inputs for 3D printing. Adoption of digital CAD processes in traditional manufacturing sectors has created opportunities to introduce more product lines, enabling rapid prototyping and fast manufacturing processes even for products and components with small production volumes. 3D printers offer huge cost and time reductions in certain industrial applications, while providing better accuracy compared to conventional manufacturing processes. This, in turn, helps SMEs and startups to reduce their costs of production, and enables large companies to make products cheaper, faster and better. The A&D vertical holds the largest share of the global 3D printing market. In the aerospace industry, 3D printing is mainly used to manufacture critical parts of airplanes or for low-scale production associated with components demanding high performance and quality. This industry holds a promising potential for the market. However, markets for emerging verticals, namely, food and culinary, printed electronics, education and energy, are expected to grow at a significant CAGR in the near future. According to industry sources, automotive applications account for the highest revenue share in the Indian 3D printer market. However, industrial and education applications have also emerged as major growth drivers along with automotive applications. Besides these, architectural, healthcare, A&D-related applications will also witness growth. Other niche applications include arts and crafts, interior decoration, fashion accessories, footwear designs, jewellery designs, animation and gaming, furniture and modelling. Medical application is another upcoming growth area for 3D printers. Demand for 3D printers in India is primarily driven through Tier-I cities. These areas account for the major potential growth for domestic manufacturers, local assemblers and distributors. Industrial customers are of primary importance for the 3D printing industry. However, private or individual customers are also showing interest. The Indian 3D printing industry can witness healthy growth in the near future, considering expected price decline and increasing market awareness coupled with major transformations like easier design capabilities, compatibility for mass production and manufacturing of large-format objects. Inefficient supply chain for raw materials and components required for 3D printer manufacturing. Limited availability of experience zones for Indian 3D printer manufacturers. Performance limitation of existing low-cost printers and expensive nature of advance 3D printing technologies. Market infiltration with poor-quality products. Highly cost-sensitive market with price pressure due to the presence of cheaper CNC milling machines (used for modelling), resulting in reluctance among consumers to purchase 3D printers.